Having spent a considerable sum on two meals, at L'eveil des Sens and Brasserie Flo, we decided to listen to the sad sobbing of our wallets. This meant budget dining. We ended up on a small square in Le Petit France. Torricelli had decent food, decent wine, and a very nice price. This was not a meal that deserves a full review. One pasta dish and one bottle of wine does not tell anything on the overall quality of a restaurant. Torricelli is located at Place Meuniers a small square in Le Petit France. We decided to be seated outside to enjoy a brilliant summer evening. Place Meuniers is hardly the most beautiful spot in this part of Strasbourg, but it was nice to sit outside. Torricelli offered seriously inexpensive food and if you look for a decent budget meal, it is definitely the place to go. 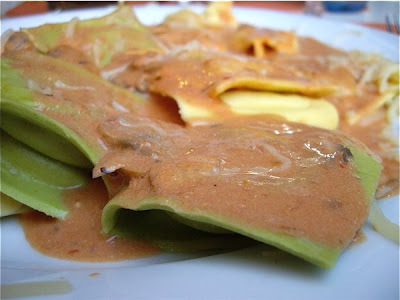 I ordered a plate of ordinary and spinach ravioli in a creamed tomato sauce. A generous portion of well prepared as pasta should be, al dente - meaning; "for your teeth". 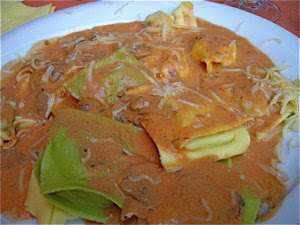 The sauce had as most tomato sauces are, too little sugar to break the acidity in the tomato. A little more would have lifted it up on a completely other level. On top - roughly grated Parmesan cheese. I have sadly not kept the bill, but we both agreed was that this is an inexpensive and good place to eat. Italian food deserves Italian wine. 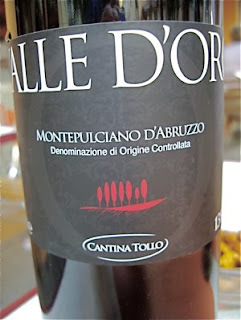 Valle d'Oro Montpulciano d'Abruzzo was a full bodied wine, ruby red colour. Rich fruit and spice aromas. Soft tannins. A joy in mid summer night. We were happy, our wallets were happy! Torricelli was a win-win for all.